Nathan Hill peeks inside a beast of a tank where a dragon-like Arowana is just one of the highlights. If you haven’t met Richard, then it’s possible at least that you’ve encountered his online forum alter-ego, T1karmann. On entering his home, and as soon as I can free myself from underneath 30kg of amorous Bulldog, I’m led through to Richard’s custom-built fish house/office conversion in the garden. Outside, the tidy wooden shed gives little away about what lurks within, but opened up it reveals Richard’s 2.5 x 2 x 1m/8 x 6 x 3' leviathan of a tank, which had to be built on site, as it was too large to carry let alone to navigate through doors and hallways! The aquarium lights are off as we arrive, though other artefacts in the room give clues about what we might be seeing inside it. Mounted on the back wall, a BMX with the race plate 'P14' hints at what the roving, dark discs swimming in the gloom will be. We have come early in the day. Usually the lights are staggered, one elderly T8 Grolux bulb firing up at the rear at 2.30pm, followed by a sharper bank of T5 bulbs one hour later. Richard overrides them, turning the Grolux on and creating silhouettes of underwater giants as he does so. 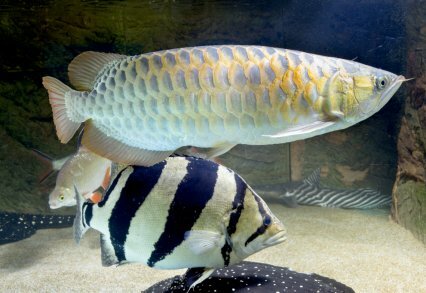 Coming in to view is one of the finest Arowana I’ve ever set eyes on, while lurking at the back sits the Perch-like shape of a huge Datnioides Tiger fish. I realise that far from the friction I’d anticipated, I’m in for a viewing treat for the day. I can barely tear myself from his magnificent eight-foot tank, as Richard tells me what’s now patently obvious. "Arowanas are my passion," he says. "The rays… that was me finding something to go with the aros." He started with ten Osteoglossum, but now there’s only one Arowana, a single Asian Scleropages formosa, also known as the dragonfish — the large scales and wide pectoral fins supposedly resembling a dragon in flight. In China especially, the dragon is a symbol of good fortune and auspiciousness. Owners are keen to keep them because of the luck they bring; it’s even said that an Arowana can deflect the death of its owner by dying itself. "I had black aros when the Asians weren’t allowed," Richard says. "Then they finally became legal again. "Someone got me a Banjar red. What a waste of time that was. Greens have shine, but the reds at best get an orange tail. An aquatic store got me a red tailed gold." Richard’s quick to tell me about the tricks of the Arowana trade: "Flick them in a bright white tank and they shine up. Then put them in a normal tank and they’ll colour down and look rubbish." I’m struck that his fish doesn’t have the 'dropeye' symptom that I’m so used to seeing. "“I’ve never had an Arowana with dropeye," he says. "I always feed live food. I never let them feed from the bottom. Nobody really knows what causes it though." There’s more to Richard’s tank than just an amazing Arowana, and I’m keen to learn about the solitary Tiger fish Richard also keeps. "I had eight (Datnioides) pulcher," he says. D. pulcher are a rare fish, a protected species in their native Thailand and not a fish you’ll ever chance upon in a shop. It’s possible that all of those still in circulation in the UK are Richard’s old stock, and he can account for where most of his ended up. The one he still owns has been back and forth. Richard paid £25 for it around eight years ago when he was running a smaller 2m x 81 x 71cm/7' x 32 x 28" tank in the main house. "I sold it for £125, and then bought it back for £150," says Richard. "After I sold him again, I eventually paid £550 to get him back because I missed him." Since then he’s been offered — and has declined — £2,800 for the fish from a buyer in Sweden. "They’re meant to be extinct in the wild now," Richard reflects. "They’re illegal to export from Thailand. As far as I know, there are only four or five left in the UK. They don’t travel too well." I ask him what the appeal is with pulcher over other species. "They always stay that gold colour," he replies. "They’re stable. Microlepis are strange under light, they go black or wash out completely. They’re unstable." Is there a secret to their care? "Keep different sizes in a group. Tigers don’t eat other tigers. If you’re keeping (Datnioides) campbelli, then keep just one to a tank. They’re really aggressive." Turning on the main lights, the full effect of the tank unleashes itself in glorious technicolour, as well as drawing my attention to Richard’s 'nibbled' decoration. The sides and rear of the tank are laid with a mosaic of Juwel polystyrene backing panels, all of which look the victims of grazing. Richard informs me that it’s his stingrays that have a taste for the décor. "I had one ray getting really fat on it. I should have covered the backing with epoxy resin." Richard’s rays are as much a delicacy as his Tiger fish. He keeps Potamotrygon leopoldi variants, banned from export from their native Brazil under IBAMA regulations. The base of his tank is graced by Black diamond and P14 types; the latter of which may be a species warranting its own classification. The rays are the reason the tank has the open plan that it does. Stingrays of this size would tear apart any plants and either uproot or harm themselves on décor. The other danger of having objects on the bottom of a ray set-up is the tendency to form dead spots —areas of slow flow where opportunistic pathogens can nestle. Sick rays are a nightmare to treat. They respond poorly to copper, as well as a whole heap of other common medications. And they can carry dormant gillworms that sit waiting for the fish’s immune system to compromise. Richard has had run-ins with these worms before, having to use tremazole to treat them. The treatment worked, but it was laborious. Post-tremazole care involves an 80% water change, which is quite something when you have over 4,091 l/900 gallons of water. Luckily for Richard, much of his tank is automated. His tank is fed constantly by an inflow of a mix of HMA and RO water, trickling in at a rate of around 200 gallons per day. His water supply runs through the HMA first, after which some of the water goes directly to the tank, and the rest then runs through his two 150gpd RO units. His sump has a built in overflow, so as the water level rises, it drains itself away. As the fresh supply fills the tank, old wastewater is pushed out at the same time. This helps to keep the pH at a low level for the rays, as his usual supply straight from the tap runs at 8.5pH. With his mix, the tank sits at a typical 6.8 to 6.9pH. "I’ve not had to do a manual water change in two years," he boasts. Given his physical situation, his tanks might be unmanageable if he had to do any lifting. A few years back, long-term illness cost him both of his legs. "When something like that happens, it hits you deep," he says. But he laughs when we chat about the idea that Arowanas are 'good luck' fish. Reflecting on his own unfortunate life events, he jokes he should have kept more. "When I had seven of them my luck was firing!" Maintenance is also kept to a minimum. Apart from wiping algae from the glass, Richard’s only concern is debris on the base of the tank, and seeing how the rays and Tinfoil barbs automatically stir everything up for him, that doesn’t rank as a huge concern! The only downside to his system is that in the event of long-term powercuts, the tank level tends to drop as it runs back into the sump, which then drains away. When power comes back on, Richard needs to be careful that the sump doesn’t run itself dry refilling the tank. However, in the event of a catastrophic power failure, Richard has a battery back-up in place involving a 240v inverter that constantly trickle-charges eight massive camping batteries. Should his main power source go down, his batteries provide enough power to keep his tank running at half power — fuelling the essentials like filters and flow pumps — for some six hours at a time. Richard’s ill health hasn’t stopped him from breeding his rays though, and he’s had numerous pups from all of them, averaging three or four litters from each. For that purpose, he has a connected tank rigged up high above the main one, fed by a 2,000 lph pump, where he can rear the young on safely. One large fish has a few bites on the sides of her disc, a common feature of breeding rays. Richard reassures me that it happens a lot, but the fish soon mend. "I had one before," he says, "that went from completely chewed up to fully healed in three weeks." 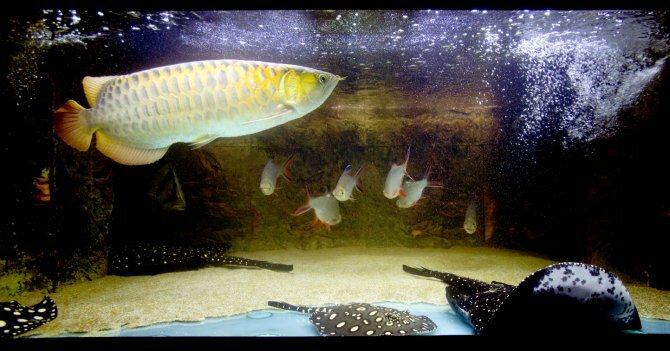 For all the showiness of the Tiger and Arowana, it seems to be the rays that run this tank. I note the plainer looking Tinfoil barbs in it, and Richard tells me about the damage to their gills. "The stingrays cloak them and chew off the gill covers. They’re lucky to get out with their eyes. Rays don’t seem to kill for food, they kill for sport. They kill for fun. If the barb shoal is too big the rays jump on them. A shoal of six is about right." "Finding fish that work in the middle with the rays is hard," says Richard. "I stick to what I know." But there are advantages to the barbs, too. "They’re the only fish I know that eat ray poo." Richard insists. "It’s like cat poo, but when one ray goes, the barbs are on it like piranhas." As if called to perform, one of the rays soon passes waste in front of us, and true to Richard’s word, the barbs are on it, part eating and part stirring up the resulting mess for the filters to draw out. Asking about feeding, Richard tells me: "Pellets are the way to go. They grow faster with pellets. Feeding any food with a high salt content makes them flick. I’m not 100% sure that’s what it is, but they always seem to flick when I feed it." He makes up his own dry food mix for many of his fish, using 1kg of Hikari Massivore, 1.5kg of Cichlid Gold medium pellet, and 1kg of sturgeon pellets. A couple of big mugs full go in every day. The Tiger fish is particularly keen. "No matter how many times you feed him, he still catches you off-guard," Richard says. Frozen food gets used, namely lancefish and prawns. "They get pellets at lunchtime and prawns in the evening," Richard tells me. "I buy about 20 bags at a time, and I always feed it to them still frozen. They like the feel of it that way. But you always get much slower growth with prawns." The Arowana gets an exclusively live offering of crickets, locusts, mealworms and waxworms. "Waxworms are full of calcium, so they make the scales thicker," I’m told. "And I don’t gut load the mealworms with carrots [carrot is a great source of beta-carotene, which helps to bring out red colours] because I find it just kills them [the mealworms]." Whatever diet Richard’s using, the fish look exceptional on it. Fish breed, and everything looks stress free — if in some cases a little battle-scarred. But he’s still critical of his stock. "The Arowana has PLJ [protruding lower jaw],” Richard says. Taking a look, I see that the bottom lip does thrust up a few millimetres above the head. It’s a negligible flaw, but one Richard seems painfully aware of. For aspiring keepers, Richard has a few pointers after years of experience. "Whatever tank you think is big enough,” he says, "it’s not." He advises keepers with little ray experience to stick to smaller species, like motoros. Giant species are a definite no-no. "Flowers and Tigers have no appeal. They just get too big." At the end of the visit, once again fighting my way past his dog and heading out to the street, I’m left with my mind chewing over Richard’s ambitions. "Everyone’s looking for the perfect Arowana," he’d said, "but there’s no such thing." Perfect or not, his own fish doesn’t fall wide of the mark, and given the amazing set-up he owns, I wonder if he’s setting the bar too high. It all looks pretty ideal in there to me. Time in hobby: 34 years. 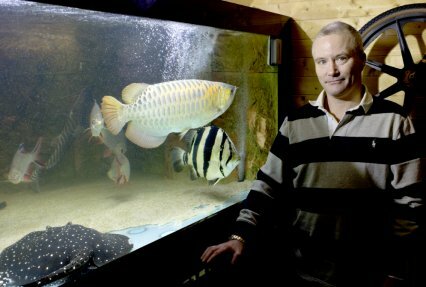 Favourite fish: Arowanas and Siamese tigerfish. 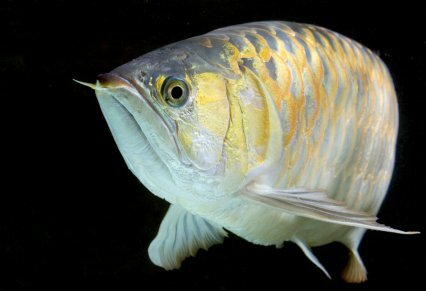 Most paid for a fish: £1,600 (Arowana). Other fish kept: Uaru fernandezyepezi. Tank: ND Aquatics 19mm glass with OptiWhite front. Water: RO and HMA mix continuous feed. Tank pH 6.8, Redox potential 300mv. Size: 2.4 x 1.8 x 0.9m/8 x 6 x 3'. Cost: The tank alone was £2,500. A big set-up like this requires more than a standard canister filter, and Richard uses a sump system bigger than most people’s tanks that contains media more familiar to pondkeepers than aquarium fans. 2m x 61 x 61cm/6 x 2 x 2' all glass sump. Jap matting, no socks (chamber one). Jap matting to the top, white polishing pad (chamber two). 40 l/9 gal Eheim Ehfimech, Ehfisubstrat and Kaldness K2 (chamber three). 2kw of heating from four 500w Aquamedic titanium heaters. Weipro thermostat system connected to weirs. 10,000lph return pump feeding four 25w Vecton UV sterilisers. Cloverleaf fluidised bed sand filter fed by a bleed from a 15,000lph pump. Aquatronica control system with leak detector, redox and pH meter, plus sump level sensor that texts Richard if there’s a problem. Blagdon Koi Air 65 for airstones in tank and sump that helps to eliminate dead spots. To see UV systems on tanks is rare. Richard uses his to keep pathogen counts low as a precautionary measure looking after his rays. Rays are rough lovers, with bites to the body discs being common. UV sterilisers help to reduce background levels of bacteria, helping to minimise the possibility of infections.